A study shows the market for fake degrees churned out by dubious diploma mills. My cat can get a Ph.D., and that’s a problem. That’s Dr. Whiskers to you. 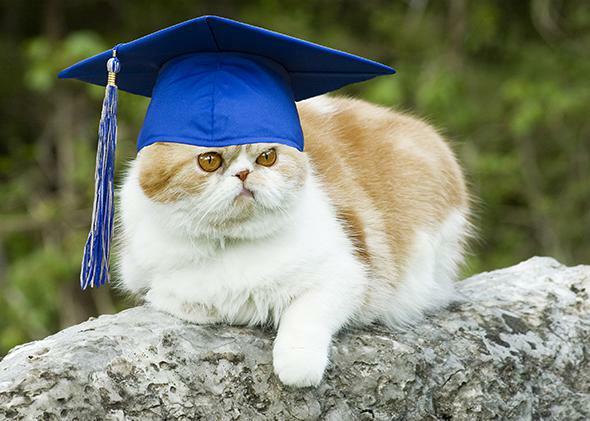 It’s surprising how many house pets hold advanced degrees. Last year a dog received his MBA from the American University of London, a non-accredited distance-learning institution. It feels as if I should add “not to be confused with the American University in London,” but getting people to confuse them seems like a pretty basic feature of the whole AUOL marketing strategy. Inside Higher Ed reports on diploma mills and fake degrees from time to time but can’t possibly cover every revelation that some professor or state official has a bogus degree, or that a “university” turns out to be run by a convicted felon from his prison cell. Even a blog dedicated to the topic, Diploma Mill News, links to just a fraction of the stories out there. Keeping up with every case is just too much; nobody has that much Schadenfreude in him. The one notable exception to that blind spot is the history of medical quackery, which enjoyed its golden age in the United States during the late 19th and early 20th centuries. Thousands of dubious practitioners throughout the U.S. got their degrees from correspondence course or fly-by-night medical schools. The fight to put both the quacks and the quack academies out of business reached its peak during the 1920s and ’30s, under the tireless leadership of Morris Fishbein, editor of the Journal of the American Medical Association. The pioneering scholar of American medical shadiness was James Harvey Young, an emeritus professor of history at Emory University when he died in 2006, who first published on the subject in the early 1950s. Princeton University Press is reissuing American Health Quackery: Collected Essays of James Harvey Young in paperback this month. But while patent medicines and dubious treatments are now routinely discussed in books and papers on medical history, very little research has appeared on the institutions—or businesses, if you prefer—that sold credentials to the snake-oil merchants of yesteryear. There are plenty still around, incidentally. In Degree Mills, Ezell and Bear cite a congressional committee’s estimate from 1986 that there were more than 5,000 fake doctors practicing in the U.S. The figure must be several times that by now. The demand for fraudulent diplomas comes from a much wider range of aspiring professionals now than in the patent-medicine era—as the example of Pete, the canine MBA, may suggest. The most general social-scientific study of the problem seems to be “An Introduction to the Economics of Fake Degrees,” published in the Journal of Economic Issues in 2008. Grolleau, et al. distinguish between counterfeit degrees (fabricated documents not actually issued by the institutions the holder thereby claims to have attended) and “degrees from bogus universities, sold outright and that can require some academic work but significantly less than comparable, legitimate accredited programs.” The latter institutions, also known as diploma mills, are sometimes backed up by equally dubious accreditation “agencies.” A table in the paper indicates that more than 200 such “accreditation mills” (defined as agencies not recognized by either the Council for Higher Education Accreditation or the U.S. Department of Education) were operating as of 2004. The authors work out the various costs, benefits, and risk factors involved in the fake-degree market, but the effort seems very provisional, not to say pointless, in the absence of solid data. They write that “fake degrees allow their holders to ‘free ride’ on the rights and benefits normally tied to legitimate degrees, without the normal investment of human capital,” which may be less of a tautology than “A=A” but not by much. The fake-degree consumer’s investment “costs” include the price demanded by the vendor but also “other ‘costs,’ such as … the fear of being discovered and stigmatized.” I suppose so, but it’s hardly the sort of expense that can be monetized. By contrast, the cost to legitimate higher-education institutions for “protecting their intellectual property rights by conducting investigations and mounting litigation against fakers” might be more readily quantified, at least in principle. So: If we had some data about the problem, we could figure out how much of a problem it is, but we don’t—and that, too, is a problem. Still, the paper is a reminder that empirical research on the whole scurvy topic would be of value—especially when you consider that in the United States, according to one study, “at least 3 percent of all doctorate degrees in occupational safety and health and related areas” are bogus. Also keep in mind Ezell Bear’s estimate in Degree Mills that 40,000 to 45,000 legitimate Ph.D.s are awarded annually in the U.S.—while 50,000 spurious Ph.D.s are purchased here. “In other words,” they write, “more than half of all people claiming a new Ph.D. have a fake degree.” And so I have decided not to make matters worse by purchasing one for my calico cat, despite “significant experiential learning” from her studies in ornithology.